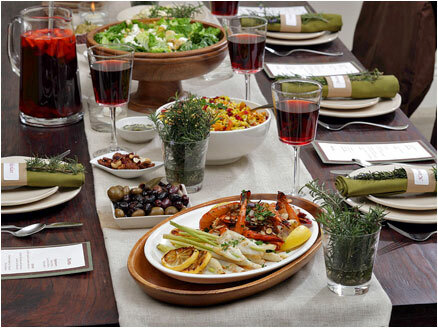 Now that life has calmed down a bit, I have more time for one of my favorite pastimes - dinner parties. PW (pre-wedding), we used to attend at least one dinner party a week and host one of our own. But with our chaotic loft (wedding crafts and Crate and Barrel gift boxes everywhere) and a long to-do list, we weren't able to get together for many social dinners. This Saturday evening we'll be heading over to our friends' home in Brentwood. I believe that in proper etiquette, the guest should always offer to bring a course (appetizer or dessert are usually good) and always, always bring a bottle of champagne, wine, or microbrew. Another tip - make sure to offer to clean up all of their hard work!